This data set reports on the flux of carbon dioxide from logged forest soils near the eddy flux tower at the km 83 site, Para, Brazil. 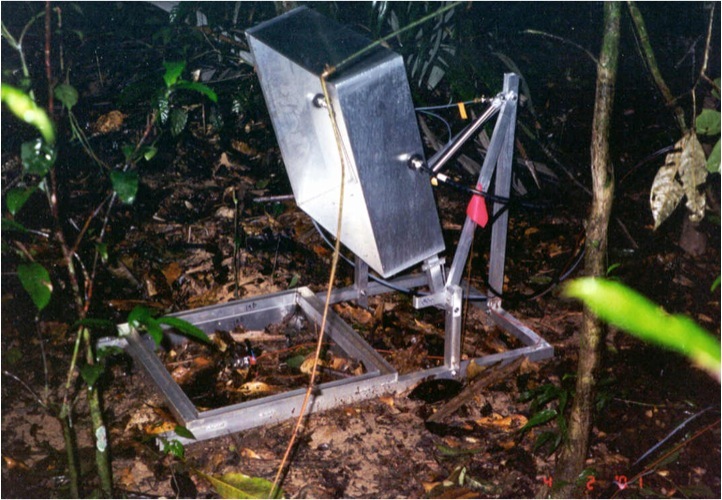 The automated soil respiration measurements were collected using 15 chambers, installed August 2001 in primary forest. Data were collected between December 19, 2001 and March 1, 2002. There is one comma-delimited data file with this data set. This data set was archived in September of 2011. Users who download the data between September 2011 and August 2016 must comply with the LBA Data and Publication Policy. Automated soil respiration measurements were collected using 15 chambers near the eddy flux tower at km 83, Tapajos National Forest, Para, Brazil. Chambers were installed August 2001 in primary forest. Selective logging occurred between September and December of 2001. After logging, 5 chambers were moved to a gap formed by the logging. Data were collected between December 19, 2001 and March 1, 2002. The data set covers the period 2001/12/19 to 2002/03/01. Soil CO2 efflux is the sum of litter decomposition, soil organic matter decomposition, and root respiration. It can account for up to 30 percent of ecosystem respiration in tropical forests. This data set is a valuable tool to determine the diurnal, seasonal, and interannual controls on CO2 efflux from the soil surface in the Tapajos National Forest. Fluxes were not calculated for periods with obvious sampling problems (e.g. abnormally high or low initial CO2 mixing ratios, extremely non-linear fluxes, etc.) Fluxes deemed good visually were fitted with a linear least squares regression to the linear part of the curve for each individual chamber closure. Efflux of CO2 from the soil was calculated as the slope of the linear fit (ppmv/min) converted to molar volume divided by the collar area and multiplied by the system volume (chamber volume and tubing volume). The short closure times for the fluxes allow for the least amount of buildup of CO2 in the chamber headspace while still allowing for a flux calculation based on 10 to 20 concentration measurements. Automated soil respiration measurements were collected near the eddy flux tower at km 83, Tapajos National Forest, Para, Brazil. Selective logging occurred between September and December of 2001. After logging, 5 chambers were moved to a gap formed by the logging. Aluminum chambers were used to measure the efflux of CO2 from the soil to the atmosphere following the procedures of Goulden and Crill (1997). Fifteen chambers were set up to measure trace gas exchange between the soil and atmosphere about 8 times a day. Each chamber was sampled for 12 min although the CO2 flux was measured within the first 4 minutes. Chambers were pushed closed over an area of 1,866 cm2 by a pneumatic cylinder onto an anchor/frame that was set about 2 cm into the soil and extended an average of 4 cm above the soil surface. Closed chambers were sealed to the frame by fitting into a water-filled trough that was replenished as needed. They enclosed an average volume of 38,100 cm3. Headspace air was pulled through an infrared gas analyzer (LI-6262, LiCor Inc., Lincoln, Nebraska, USA) in absolute mode at a flow rate of 300 ml m-1 (MKS Instruments, Andover, MA). Air was circulated through the chambers at 1,000 ml min-1. Chambers were intentionally leaky to ensure no pressure gradient when the chambers were closed. All tubing and connectors were selected to minimize water vapor, and CO2 absorption and permeability. The data were recorded and the system managed with a CR10X datalogger (Campbell Scientific, Logan UT). The chamber temperature, IRGA sample cell pressure, and raw CO2 were sampled every 3 seconds and averaged every 12 seconds. The solenoids used for chamber selection, chamber closure and calibration were controlled with four 16-channel control modules. The set point for the mass flow controller was provided by a 4 channel analog output module. The signals from the thermocouples in each chamber were multiplexed. Goulden M.L. and P.M. Crill. 1997. Automated measurements of CO2 exchange at the moss surface of a black spruce forest. Tree Physiology 17:537-542. Goulden, M.L., S.D. Miller, H.R. da Rocha, M.C. Menton, H.C. de Freitas, A.M.E.S. Figueira, and C.A.D. de Sousa. 2004. Diel and seasonal patterns of tropical forest CO2 exchange. Ecological Applications Supplement, 14(4):S42-S54.